I had to get brutal with my nail polish collection this month to make way for some new polishes. Managed to cull 15 polishes. ELF Glitter Glam - This one had gone solid [swatch]. La Femme - Princess - It had separated and gone all strange. Essence Chic Reloaded 122 - I'd used this one up, it was a nice duochrome and the brushes are easy to work with being flat and wide with a curved cuticle [swatch]. Kleancolor Blue Satin 37- Another one which had turned solid [swatch]. Stargazer 105 - I had used this one up, a nice shimmer navy colour [swatch]. Maybelline - Cosmo Flash - I did like this, it was my first flakie polish but it dried up so quickly. I had brought it back to life numerous times but I have had enough of it now and have better flakie polishes in my collection. Ciate - Cupcake Queen - Another empty polish, quite unique. A Barbie pink with a blue shimmer to it [swatch]. George - Molton Metals Party Animal - Finished this polish it was great for stamping [swatch]. ELF Metal Madness - Used this polish up, nice enough but don't think I will repurchase this [swatch]. ELF Fire Coral - Another one I'd used up, great for Halloween [swatch]. La Femme - Classique, Pink Ice and Mint - All three of these are as new, they are very pearlescent and not my kind of polish. They bubble on the nail as well which is annoying. Belle Glamour - Green Shimmer - Not opaque enough for me and the colour again isn't a favourite of mine. Miss Sporty - New Black - One I finished, nice enough nail polish but not a repurchase for me. Superdrug Acetone Free Remover - I really didn't like this one, it smelt bad and took a long time to get rid of the nail polish. Jelly Belly Blueberry Lip Balm - Don't think this did anything for my lips, but I used it up all the same. 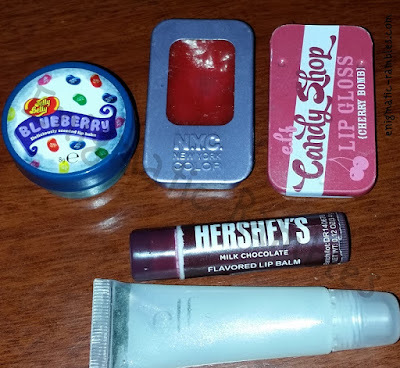 NYC Lip Balm - I used this for a while but the packaging is annoying. ELF Lip Gloss Cherry Bomb - This was really nice but it went off so time to put it in the bin. Hersheys Milk Chocolate Lip Balm - A very waxy lip balm, it is a bit tinted brown. I used it up but not a repurchase for me. ELF - Lip Gloss - Better packaging than the other ELF gloss but it was getting past it and I'd not really used it because I am not someone who really wears gloss. ELF - Complexion Perfection - My go to setting powder. I like to use certain colours for targeted areas and then all over as a powder [review]. 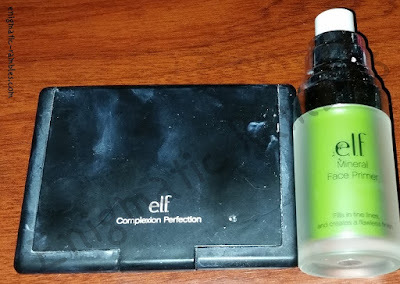 ELF Face Primer Tone Correcting Green - I like the primer as a primer but it is exactly the same as the normal primer. I don't find the green tone of it does anything different to the standard line one [review]. Yankee Candle Moroccan Argan Oil Votive - Surprisingly nice, smells a bit oriental. 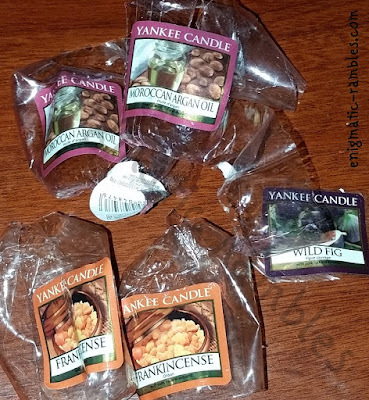 Yankee Candle Frankincense Votive - I'd not smelled anything with this scent before it was a little musky though. I don't find they have much of a scent throw. Yankee Candle Wild Fig Wax Tart - Now this does have a great scent throw, it filled the entire room and we have particularly high ceilings. Gorgeous and will buy again. I also do have those argan oil yankee candles! <3 Impressed by how many polished you finished this month though!